Now you can experience its health giving powers now that Cordyceps is easy to get and low in cost! In 1993, China's Wan Jun-Sha broke the 10,000 meter world record by an astounding 40 seconds at 29 minutes 31.78 seconds at the World Track and Field meet in Stutgart, Germany! She performed so well, officials and coaches suggested she may have been using illegal steroids. But testing proved she was clean. When asked how she could perform such remarkable feats she acknowledged a rigorous training schedule and that she took a special herbal drink after each training session. That drink was Cordyceps! If you look forward to the day when you feel healthy, have energy, and feel young, R-Garden's Cordyceps can help you! Asians use an amazing variety of herbs and natural products for healing, and to maintain good health. One of their most potent natural healers is Cordyceps. Cordyceps is a powerful life enhancing tonic and an extremely effective and unique herb able to benefit many body systems. Cordyceps can be used safely and over a long period of time. It has a huge amount of benefits to many body parts and this makes it rank as high as ginseng, reishi and deer antler. R-Garden's Cordyceps is 100% natural, and taken everyday, will begin to help heal your body and give you more energy. It has been found by scientists and doctors to be safe - without side effects for most people. Start now to benefit from all the healthy effects! We believe you will have more get-up-and-go and more control over your health. You should start to feel younger again within just a short time. A 68-year-old man suffered from bronchitis for 18 years. It had gotten worse over the years and caused him to cough up a lot of thick phlegm. He also had night sweating, panting, dizziness, a heavy feeling in the body and low energy. After taking Cordyceps for only 5 days, his coughing and phlegm were reduced significantly. After 2 weeks the tight feeling in his chest and panting were gone. He could run slowly for 200 yards. His cough disappeared and his dizziness, low energy and weakness were nearly gone. After one month of taking Cordyceps, his lung function went back to normal. A 36-year-old man was diagnosed with cirrhosis and chronic liver dysfunction. He suffered from extreme fatigue, rib pain, abdominal bloating, low weight, poor appetite, insomnia, low fever, sweating and emotional problems. After taking Cordyceps for 2 months, his abdominal bloating lessened considerably and he ate and slept better and had more energy. After 10 months on Cordyceps all his symptoms disappeared and he felt like a new man! A 44-year-old woman had received chemotherapy due to breast cancer surgery and her white cells and immune function were lowered considerably. After taking Cordyceps for one month, all blood chemistry went back to normal and she was able to complete treatment! A 70-year-old woman suffered from a coronary heart condition for 18 years. Her EKGs showed abnormalities and she suffered from arrhythmia and angina. She tried many medications with no positive results. After being on Cordyceps for one month, all clinical symptoms disappeared and her EKG showed vast improvement. After completing one treatment cycle, her EKG was totally normal. A follow-up one year later showed no relapse. A 42-year-old woman suffered from low energy, asthma, edema and a poor heart condition. After taking Cordyceps for two weeks, most symptoms were improving and at 6 months all symptoms and conditions disappeared. A middle-aged man was diagnosed with stomach cancer. The man was given Cordyceps and had taken it about a month before his scheduled cancer operation. To the doctor's amazement, the cancer cells had shrunk and the operation was postponed. Another checkup two weeks later showed that the cancer cells had disappeared altogether. The doctor then asked where he could get some Cordyceps for himself! A middle-aged male golfer in Japan had always been in excellent health his entire life. But he recently had felt a considerable decline in his energy level. This became clear when hitting drives and trying to be consistent on the 3rd or 4th round. After taking Cordyceps for a very short period of time, he was able to improve his performance considerably and surprised all his opponents. 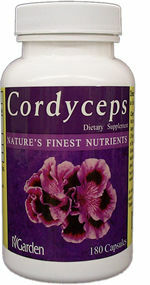 I am writing to thank you and let you know how much I love your Cordyceps product. I have been taking Cordyceps for a year now and I really feel better. No more unexplained and prolonged fatigue. I’ve been taking Cordyceps for over three years. Since that time, I haven’t been sick, not even in the winter months. I have so much energy, I feel like a kid again. Cordyceps – this is what I use. I have been using it for a few years. I got the name from a flyer. I had had pneumonia and I was very weak. I ordered these supplements and inside of 4 weeks I was back at work. They are the best I ever heard of. Thanks a million for Cordyceps. If you want to have more energy, improve your health and live a higher quality of life, then Cordyceps is the proven way to do it safely with amazing results! 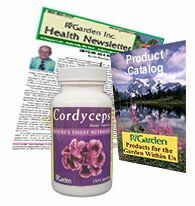 *Click here to buy your risk-free R-Garden Cordyceps and receive a free 6 month subscription to our full color health newsletter which contains vital information on cutting edge health issues, and you will receive a color catalog of R-Garden products. Disclaimer: These testimonials do not imply that similar results will happen with your use of our products. We make no medical claims as to the benefits of any of our products to improve medical conditions.